Photo Credits: Courtesy of Countercurrents. The West is doing everything to fabricate a cause of war against or to isolate Russia further internationally. So far, ‚Novichok‘ rests on rumors. The affair was made up the British and the French intelligence agencies without having presented any evidence. 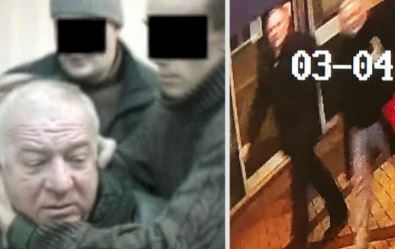 The term ‚Novichok‘ was used to sound Russian, in fact, this nerve agent is known internationally as A-234. Instead, the Western alliance presents this case as a foregone conclusion. And the Western fawning media agitate as cheerleaders, having specialized in producing fake news a long time ago. Many countries are producing this kind of nerve gas, among them a British company close to the town Salisbury, where the incident happened. What about the U.S., Israel, Uzbekistan, France, and the Brits themselves? Israel has a vast stockpile of biochemical weapons and does not allow internal inspections. To believe the British story, told by Theresa May or even Boris Johnson, is like thinking into Easter bunny. So far, the Brits have been dining any requests by Russia to take part in the solving of this case. Why? As the public got told, Yulia Skripal, the daughter of double agent Sergei Skripal, is on the road to recovery. Both are still Russian citizens. Russia has been denied to care about its citizens. When can Yulia Skripal testify, do the British intelligence tells her what to say publically? Perhaps she can even ‚prove‘ that President Putin himself committed the attack!!! „1. Why has Russia been denied the right of consular access to the two Russian citizens, who came to harm on British territory? What specific antidotes and in what form were the victims injected with? How did such antidotes come into the possession of British doctors at the scene of the incident? On what grounds was France involved in technical cooperation in the investigation of the incident, in which Russian citizens were injured? Did the UK notify the OPCW (Organization for the Prohibition of Chemical Weapons) of France’s involvement in the investigation of the Salisbury incident? What does France have to do with the incident, involving two Russian citizens in the UK? What rules of UK procedural legislation allow for the involvement of a foreign state in an internal investigation? What evidence was handed over to France to be studied and for the investigation to be conducted? Were the French experts present during the sampling of biomaterial from Sergei and Yulia Skripal? Was the study of biomaterials from Sergei and Yulia Skripal conducted by the French experts and, if so, in which specific laboratories? Does the UK have the materials involved in the investigation carried out by France? Have the results of the French investigation been presented to the OPCW Technical Secretariat? Based on what attributes were the alleged “Russian origin” of the substance used in Salisbury established? Does the UK have control samples of the chemical warfare agent, which British representatives refer to as “Novichok”? A similar list of questions was sent to the French foreign ministry by the Russian embassy in Paris. Russia wanted to know on what grounds France was involved in this case. How come that France got a sample of this nerve gas? Or do the French produce this gas themselves? The so-called free Western media do not ask these questions. Instead, they repeat the unfounded allegation by the Brits against Russia, which is so faring fact-free. How credible is the West, after having staged several incidents that led to wars. Such as Pearl Harbor (Franklin D. Roosevelt knew about it in advance), the Gulf of Tonkin affair, Operation Northwood, operation ‚Gladio‘ where NATO countries maintained secret armies to commit terrorist attacks and put the blame on the left. The infamous incubator affair, where Saddam’s so-called henchmen trough new-born out of the incubators. But it doesn’t end here, the staging of the attack against Iraq by Colin Powell’s infamous speech before the UN about alleged Iraqi WMDs and the fabricated dossier of the Brits under Tony Blair. The latest fabrication concerns the US elections. The so-called Russian collusion in the American electoral process was initiated under the Obama administration and puffed up after Hillary Clinton lost. Without the Deep State and the remains of the criminal Obama people in the administration, this engineering could have never taken place in a properly functioning democracy. The real problems are not the crooks in the different Western administrations but the media. They have been hammering the fake news home to the minds of the people to believe it as reality. Without having presented any evidence in the so-called Russian collusion affair into the American elections nor the alleged Russian nerve gas attack against Skripal and his daughter, the media have established rumors as facts. That’s how Western ‚free‘ media operate, and Western ‚democracy‘ is functioning. For both, the future looks bleak. First published here, here. here, here and here. For further detailed information about the staged ‚Novichok‘ affair. Dieser Beitrag wurde unter Internationale Politik abgelegt am April 1, 2018 von Ludwig Watzal.